Rochester Hollow is a relatively unknown gem in the 5375 acre Shandaken Wild Forest in Catskill Park. There are nearly five miles of marked trails to explore the area. The Rochester Hollow Lean To is the most popular destination for hikers in this area. The John Burroughs Memorial Forest is another destination in the Rochester Hollow area. The GPS coordinates of the trailhead is N42 06.983 W74 27.050. The trailhead is located at the end of Matyas Road off NY 28. The road starts off as a paved road, while the last section becomes a single lane dirt road that ends at the parking area. The dirt road almost looks like a driveway as you pass the last private home on your left. Don't let this fool you as this is the dirt road to the trailhead. Colonel Rochester Trail is the main trail in Rochester Hollow and is marked with blue DEC markers. The trail follows an old road that dates back to the 1700s. The trail travels a total of 2.7 miles. It is 2.4 miles from the trailhead to the Rochester Hollow Lean To. From the trailhead, pass by the yellow gate near the kiosk and follow the old road as it gently climbs while following a scenic little stream. You will pass two designated campsites during the first 0.3 miles of hiking. The trail passes a gateway at 1.4 miles and reaches the junction of the yellow marked John Burroughs Memorial Forest Trail at 1.7 miles. The Colonel Rochester Trail turns left at this junction, while the John Burroughs Memorial Forest Trail is on the right. Soon there is another junction at 1.8 miles on the left of the red marked Eignor Farm Trail. The blue marked Colonel Rochester Trail continues straight and the yellow marked John Burroughs Memorial Forest Trail comes in on your right at 2.0 miles. The trail reaches what is left of an old estate at 2.3 miles. The Rochester Hollow Lean To is reached at 2.4 miles. The red marked Eignor Farm Trail also comes in near the lean to. The old road continues and reaches the state land boundary at 2.7 miles, where there is a gate and DO NOT ENTER sign as the old road enters PRIVATE PROPERTY. You can utilize the Burroughs Memorial Forest Trail and the Eignor Farm Trail with the main Colonel Rochester Trail to create different loop hikes to explore this scenic area that does not get the traffic compared to other hiking destinations in the Catskills. 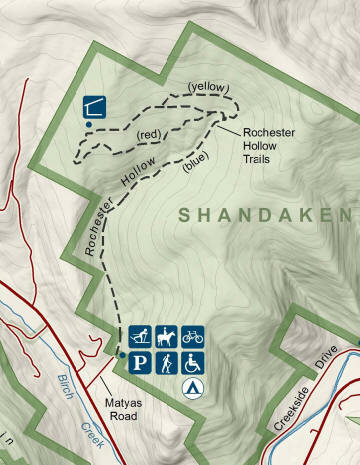 Look below for a few pictures and maps of the Rochester Hollow Trails.